General Information: The tropical yam (Dioscorea alata) should not be confused with sweet potato, which is sometimes called "yam" in the United States. Its consumption by various ethnic groups (African, Caribbean, Latin American and Asian) has helped extend its trade to the major industrialized countries. 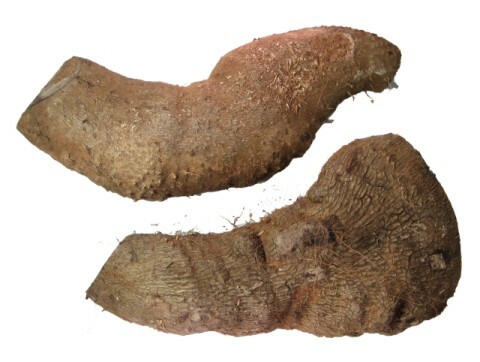 This is one type of Yam grown in Jamaica. It is white in colour and is slightly soft at times when cooked. Yams are exported to the US on a year-round basis. Both production and demand fall during warmer weather, resulting in a decline in imports in the spring until an increase at summer�s end. Registered highs for Februaryand March suggest an increase in yam consumption during the colder winter months. This increase during the winter period is associated to the consumption of stews and other food applications that contain yams. Quality yams should be brown, clean, and fresh and should have reached their full maturity in the field before harvest. Skin should be entirelyintact, with no surface shriveling, fungal infection, insect damage, or sprouting.